The night shelter, after some more research, turns out to have had a very interesting history. Set up in 1860 it was one of the first shelters for the homeless. The building on that site remained as a shelter until 2001 when it was sold to the Osborne group and Manhattan Loft Corporation. (btw MLC strap line is: Bringing New York loft-style living to London with a collection of beautifully designed and executed loft conversions….) Providence Row still exists as an organisation that helps the homeless but now has an office at Wentworth Street. The above is a letter written in 1896 soliciting funds for the shelter. It is specially desired to call the attention of the charitable to some distinguishing marks of the Charity. In the first place it is absolutely non-sectarian. There are no questions as to nationality or creed. Whilst there is accommodation in the Refuge, no bona-fide applicant is refused, the sole passport necessary being genuine poverty and want. As an example of the distress, which exists in our midst may be mentioned that in the Refuge last year, amongst those assisted were an Architect, an Optician, clerks, waiters, valets, woodcarvers, ivory-turners, weavers, painters, a professor of music, a linguist, certificated teachers, dressmakers, domestic servants, etc., etc. 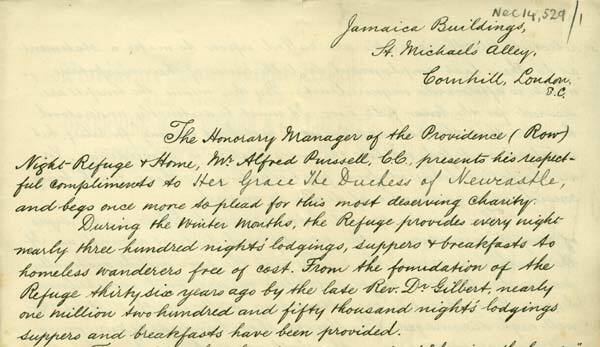 In addition to the Refuge, there are two homes, one for Servants, who partially support themselves by work, the other where women out of engagements can board and lodge at a small cost per week, whilst searching for situations. a leading banker warned that Britain is facing a “tsunami” of house repossessions as soon as interest rates start to rise. Richard Banks, chief executive of UK Asset Resolution (UKAR), the body that runs the £80bn of mortgages bailed out by the taxpayer during the banking crisis, said 23,000 of his group’s 750,000 mortgage holders are more than six months behind with repayments, adding that projections for the number of people falling behind could get “scary” if lenders did nothing to prepare for higher rates. I think about night in the city, especially night in an area like that of the SLICE with its cheek-to-cheek juxtaposition of very different communities. Where to find shelter at night? The shadow of Spitalfields church at night is both peaceful and stern. During the Winter Months, the Refuge provides every night nearly three hundred night’s lodgings, suppers & breakfasts to homeless wanderers free of cost. From the foundation of the Refuge thirty six years ago by the late Rev. Dr. Gilbert, nearly one million two hundred and fifty thousand night’s lodgings suppers and breakfasts have been provided. The work of the charity does not end at “feeding the hungry” and “harbouring the harbourless”. It is also the means of enabling many of those, who find shelter within the walls of the Refuge, to begin life afresh, and to obtain again a position for themselves in the world. Those, for example, who through dire necessity, to save their families from starvation or worse, have parted with their tools, are enabled to recover them: sellers of fusees, flowers, newspapers, bootlaces, and the like, without hope or money, are supplied with a little stock: rent is paid and a small allowance granted to mothers and children, when the breadwinner through sickness is unable to work: the ragged are also clothed and situations obtained for them. I love how much there is to take in on our first Sunday SLICE ramble. There is the Pevsner Guide – with its dry, authorial voice – which draws and repels me at the same time. Paul reads it very well. The amazing SLICE photograph (see above) which I try and follow in such a way that makes me feel slightly disembodied (or maybe seasick?) as I negotiate a bird’s eye view with my own pedestrian one. There is everything else that’s happening right in front of me – people, dogs, cars, roads, sirens, trees, shops, church-spire, signs, light, shadow, wind, heat, throw-away gestures, drunk-dancing (signs of the night before), ghosts (bound to be), histories, regrets, promises, you-name-it…. it’s only early on a Sunday, but already the day is full of it. Paul tells me that according to Pevsner, the edge of Crispin street had a night shelter. A night shelter with mercy in its title that is now student accommodation. It’s opposite the amazing car park that Steve mentions in his post. Mercy – original meaning: reward or recompense. I’m drawn to mercy because it’s an act – both theatrical and everyday. I look up the site afterwards and find this: This building was formerly the Providence Row Refuge and Crispin Street Convent. It was a night shelter run by the Sisters of Mercy. Men and women would be admitted to the refuge through separate entrances. at the mercy of the elements. I think about the Leonard Cohen song (Sisters of Mercy) and then the Goth Rock band who took their name from this song and eventually disappeared from sight because they stopped recording new material as part of a strike action against their record company (!). Maybe this is a distraction, as is this note at the end of the description of the night shelter: Mary Kelly, Jack the Ripper’s 5th victim, is believed to have stayed here.